Want to take the hassle out of catering for your next gathering? Or simply want to impress with a gift for the hostess, new Mum or just surprise someone special? There's a stack of occasions that our Grazeboxes are perfect for - including when you simply want someone else to take care of things! You can come and collect your box or we can deliver it*. The biggest problem you'll have is deciding which one you want! We can customise them to make them Gluten free at no extra charge. Step 3 = Click submit & we will get back to ASAP to confirm the details of your order. Perfect for an intimate evening with a bottle of wine, Date night feeds 2 or up to 4 people. 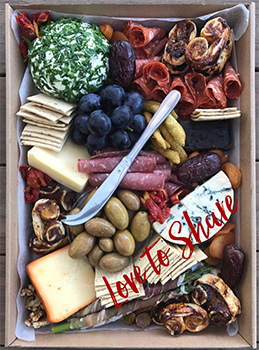 As the name suggests there's plenty to share around in our Love to Share box. Feeding 6-8 people it's great for barbeques and gatherings - the perfect hostess gift when you want to impress! 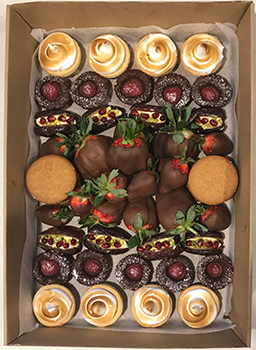 The "Big Daddy" of our boxes, Group Love caters for 10-16 people and is perfect for parties and larger gatherings. 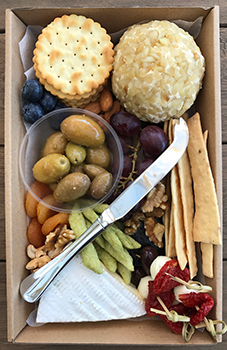 The quintessential original grazing mix, cheeses, antipasto, fruit, nuts, and crackers including some of our handmade specialties, including our marinated olives, a signature cheeseball, fruit pastes or roladas and perhaps some Pick Bites, or palmiers . Meatatarians delight! A stunning array of coldcuts featuring a variety of our Pick Bites featuring a mix of sliced & cured meats with cheese fruit or veg combinations. There's several varieties of salamis and other cold cuts, you will not be left wanting! 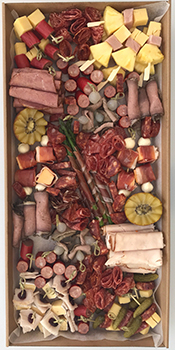 This is for the turophiles, our grazebox dedicated to fromage. With our homemade fruit pastes and roladas to compliment it plus Gwydir Grove home marinated olives. 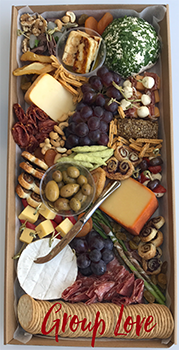 Every box contains one of our signature cheeseballs as well as a variety of cheeses and crackers. A vegetarian grazebox that features crudites, crackers and Artisan breads with a selection from our home-made dips, marinated & stuffed veg range. After the meal there's got to be something sweet! Or perhaps you're planning a morning or afternoon tea and are solely focused on sweet things! We create sweet boxes of cakes, tarts and slices. How would you like to receive your GrazeBox? There is a charge of $15.00 for deliveries within 5km of us, if you are further we will let you know the charge once we receive the order. Great we look forward to seeing you then! 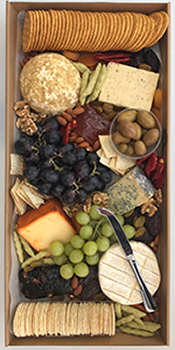 Is this GrazeBox a gift? 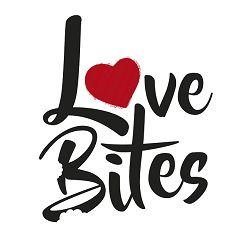 Yes, I'm sharing the love! No way, it's all mine! Wonderful! Would you like us to include a card? What would you like us to write on the card for you? How would you like to pay for your GrazeBox? CASH - I'll pay cash on collection / delivery. CREDIT CARD - please send me a link via email to pay. **Note credit-card payments attract a 2.5% surcharge. TRANSFER - Please send me an invoice with your bank details for transfer.